Ford has revealed a new and even more efficient Focus EcoBoost which boasts of CO2 emission of 99g/km, making it the only car in its class with emission under 100g/km. The new Ford Focus 1.0-litre EcoBoost generates 99PS and delivers high fuel efficiency of 28.7 kmpl, making it to most efficient petrol-powered car in the class. The new Focus achieves these stunning figures courtesy a re-mapped ECU and Ford's ECOnetic Technology, which includes ultra-low rolling resistance tyres, unique aerodynamics, automatic start/stop function and revised gearing assembly. Compared to its big brother - the 1.6-litre Ford Focus - the new Focus EcoBoost is more powerful and produces 47 per cent less CO2. 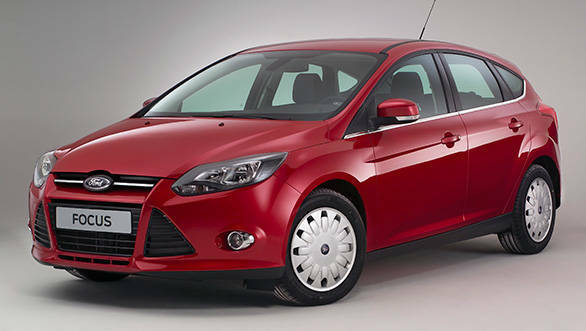 With the new improved 1.0-litre EcoBoost, there are now three Focus EcoBoost hatches in the market. The other two are the standard version of the 1.0-litre EcoBoost that develops 99PS and emits 109g/km of CO2, and a 123PS version emitting 114g/km of CO2 . "Just a couple of years ago few would have thought that a medium-sized petrol car could break the 100g/km CO2 barrier. Ford's 1.0-litre EcoBoost engine has a habit of taking expectations of what a petrol engine can deliver and turning them upside down." said Barb Samardzich, V-P, European Product Development, Ford. The 123 PS EcoBoost engine is already available in India in the Ford EcoSport. Ford is also providing three new Navigator trims of the Focus: The Zetec Navigator with Ford navigation, new 16inch alloys and central console; the Titanium Navigator with Sony satellite navigation, new 16inch alloys and rear parking sensors; and the Titanium X Navigator with Sony satellite navigation, rear view camera and new 17inch alloys. The Navigator trims are available in the UK and are priced at £17,555 (Rs 16.64 lakh, UK) , £19,295 (Rs 18.29 lakh, UK) and £21,295 (Rs 20.1 lakh, UK) for the Zetec, Titanium and Titanium X respectively.